QU cork flooring is quality cork that is the perfect way to reduce noise in a room, and add warmth and comfort. 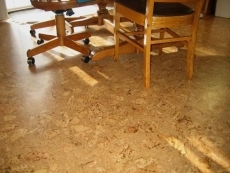 Also, since this flooring is made of cork, it is extremely environmentally friendly. If you don’t know already, cork is a great wooden material for sustaining the environment because it is harvested without cutting down the trees that provide it, meaning that it has almost zero impact on the natural environment! Do you walk into your home and look at a floor that makes you disgusted with yourself? Does your house look like a barren wasteland that would make even the least squeamish person vomit uncontrollably? You know it totally does, so why not add some flair with a quality cork floor by QU that will greatly enhance the appearance of your home while at the same time helping to protect the environment? Cork flooring is available in so many colors and designs that your house is going to look gorgeous, finally convincing people that you aren’t a total failure! Seriously, why wouldn’t you use a cork floor in your living areas? This flooring option provides a warm wooden look with minimal environmental impact, which is something you can use to upstage all of those jerks you know with hardwood floors. Install a QU cork floor in your home, and you will never have to worry about looking like a loser in front of your friends ever again!